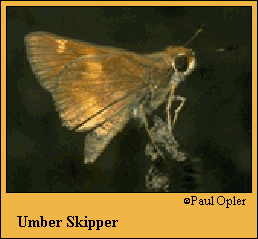 Identification: Upperside is umber brown; forewing with darker disc and pale spots; hindwing with a light yellow-brown band. Female is larger and lighter colored. Underside resembles upperside but spots are larger and lighter; forewing base is black. Life history: Males perch in grassy areas to wait for receptive females. Caterpillars feed on leaves and live in shelters of rolled or tied leaves. Flight: Two broods from March-May and September-October. Caterpillar hosts: Various grasses including tufted hairgrass (Deschampsia caespitosa), Bermuda grass (Cynodon dactylon), California brome (Bromus carinatus); and sedges including San Diego sedge (Carex spissa). Habitat: Desert foothills, grassy areas, streamsides, roadsides, yards, parks, open oak woodland. Range: California west of the Sierra Nevada Divide; southern Arizona; Baja California and the highlands of Mexico and Central America.